TP-Link’s KC120 Kasa Cam marks the company’s entrance to the security camera market, but it’s already something of an old hand when it comes to the smart home, offering a mesh router, white and color smart bulbs, smart plugs, and even a smart switch. Something tells me TP-link has been taking note of the best and worst the market has to offer, because the KC120 (available at Amazon for $130) is surprisingly refined for a new product, boasting advanced features, a clean and speedy app, and integration with Amazon’s Echo Show smart speaker and display. Over the last couple of years, we’ve seen home security camera design evolve to incorporate all kinds of shapes, sizes, and stylistic flourishes. The Kasa Cam harks back to the simple look of the original Dropcam/Nest Cam. The stand is hinged at the bottom, so you can angle the camera forward or back for a better view. That flexibility is particularly handy if you screw the camera to a wall with the included mounting disc. The Kasa Cam features a 1080p lens with a 130-degree field of view that should easily take in most good-sized living rooms. It sends push notifications when it detects motion and sound, and it supports two-way audio for communicating remotely with homebound family members (or creatively startling intruders). The Kasa Cam harks back to the look of the original Dropcam and Nest Cam. TP-Link offers a trio of cloud subscription options for saving your surveillance clips. A free Basic plan gives you 1GB of storage and allows you view up to two days of video history. For for $5 a month, you can upgrade to the Standard plan, which bumps it up to 14GB of storage and two weeks of history, or the Premier plan for $10 a month, which gives you 30GB of storage and 30 days of history. The KC120 Kasa Cam comes with a 30-day trial of the Premier plan and defaults to the Basic plan unless you upgrade. TP-Link says discounts are offered for annual payments, and if you buy two or more cameras, all cloud subscriptions are discounted by 50 percent. The Kasa app interface keeps it clean. 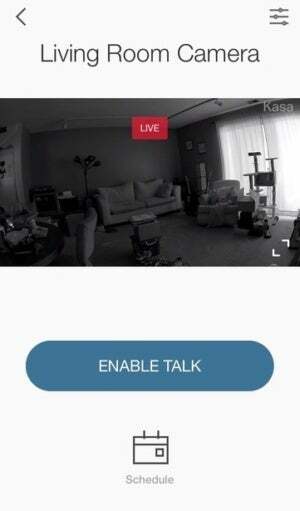 The Kasa Cam is controlled by the same Kasa app used for TP-Link’s other smart home products. Once you plug in the camera, the app will guide you through the setup process of connecting first to the Kasa Cam and then to your Wi-Fi. Once the camera is connected, you’ll see it on the devices tab along with any other TP-Link smart home appliances you may be using. Tapping the Kasa Cam takes you to the live feed. In most security camera apps, you’ll find a selection of camera controls on the live-feed screen. These typically include buttons for taking screenshots, manually recording a video clip, muting the audio, and activating the camera’s mic. The feed screen for the Kasa Cam is comparatively spartan—there’s only a large button labeled “enable talk” for triggering the mic and a calendar icon that takes you to the app’s scheduling feature. The mute button is the most notable omission, simply because hearing the feed’s ambient audio may not always be desirable depending on where you’re at when you’re checking in. The Kasa Cam produced tack-sharp images in both 720p and 1080p resolution, with rich colors and even lighting. There wasn’t a trace of image-bending along the edges that you often see with wide-angle lenses, either. It retained that crispness in night vision mode, but the image lacked contrast, with darker colors all converting to the same middle grey tone. That made it hard to identify characteristics of people passing in front of the camera, particularly if they were at a distance as the Kasa Cam has doesn’t have any zoom option. A common complaint around home security cameras is that there’s too long of a lag getting to the live feed when you receive a sound or motion detection alert. Even a 10-second wait can be agonizing when the security of your home and safety of your family is at stake, and often the triggering activity is over by the time you can see what’s going on. 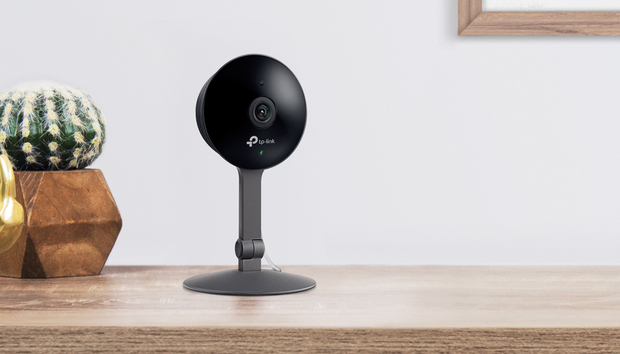 According to a TP-Link spokesperson, reducing that wait to a second or less was one of the aims for the Kasa Cam. Based on my testing, it was successful—whether accessing the feed from a cold app launch or a motion-detected video clip from an alert, connection was near instantaneous. Activity zones let you restrict motion detection to certain areas such as doors and windows. The default sensitivity settings for both motion and sound were just about right for me, but you can increase or decrease them for each within the app. You can also turn sound detection off completely. 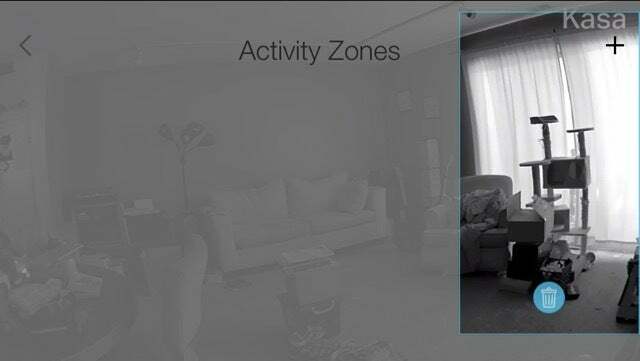 The Kasa app also lets you set multiple activity zones, so you can confine motions detection to certain areas. It works by having you add resizable squares over desired parts of the image, such as doors and windows. Out of the box, the camera will automatically record video and audio when it detects sound and motion. You can turn auto recording of in the privacy settings, or alternately, use the the scheduling feature to have the camera record triggering events only during certain days and times. You can pair the Kasa Cam with Amazon’s Echo Show and use the latter to view your camera feed. This is great when you’re using the camera as a baby monitor or maybe keeping tabs on an ill family member in another room. The Kasa Cam is a really impressive security camera with robust features you often don’t see at this price. The app is well designed and easy to use, and the camera’s integration with Echo Show makes it a great option for in-home monitoring if you have a baby or are caring for ailing elderly parents.